Having brought a dark and dingy flat in the heart of St Ives, our private client turned to Underwild Design & Development to help transform it into a highly contemporary, warehouse style apartment boasting a series of eye catching interior design elements. Create a unique interior living space, completed to an extremely high level finish. 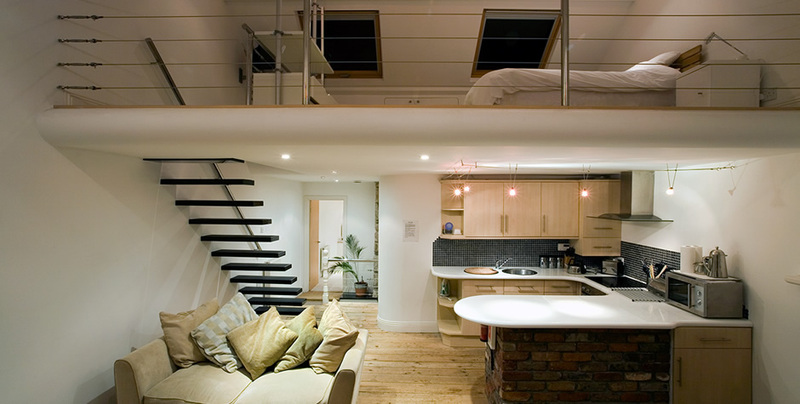 Design and instilation of a galleried bedroom on the Mezzanine floor and one of the key design features of the development – the installation of a cantilevered, suspended staircase. Throughout the project there was an overriding emphasis on attention to detail. Required the complete demolition of the existing interior fabric of the building – a challenge in itself given there was no vehicular access to the main entrance of the building and no parking facilities. In addition to the challenge of removing existing building waste, large steels also had to be incorporated in the build to enable the new Mezzanine flooring to be created. Complete transformation of what was a dark and dingy flat into a highly contemporary, open plan living space with Mezzanine floor. Key interior design features included the development and installation of a cantilevered, suspended staircase.